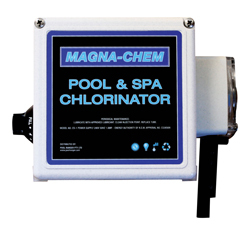 Saltmate saltwater chlorinators are designed to save the pool owner time, money and effort while setting new standards in terms of materials, quality and functionality. 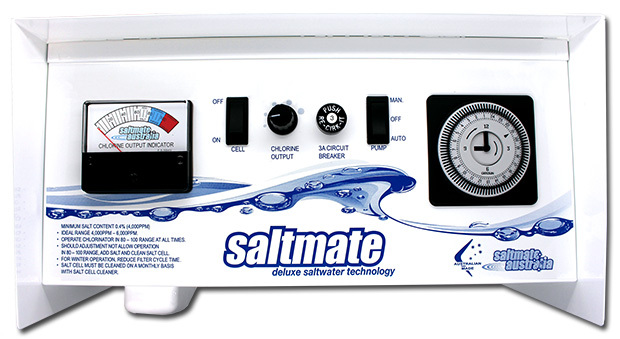 If the prospect of never having to fuss with the hassles of chlorine or cell cleaning again isn't enough to make you a Saltmate Premium RPXL Chlorinator fan think of this; "designed to save the pool owner time, money and effort while setting new standards in terms of materials, quality and functionality" No more red eyes, no more skin irritation and no time lost due to high chlorine concentrations - just soft, safe, sparkling pool water for you and your family to enjoy. 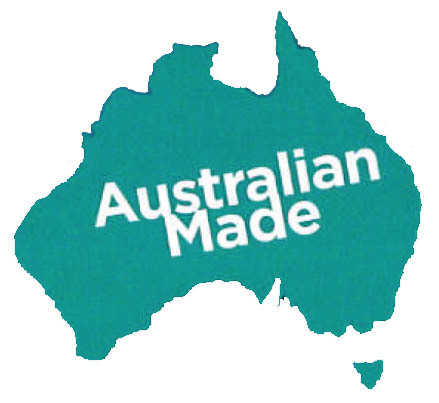 The Premium RPXL Saltwater Chlorinator range has been designed and constructed in Australia specifically to be weather protected to an I.P 34 rating with a water resistant robust metal casing to ensure that it will withstand the harsh outdoor climate. 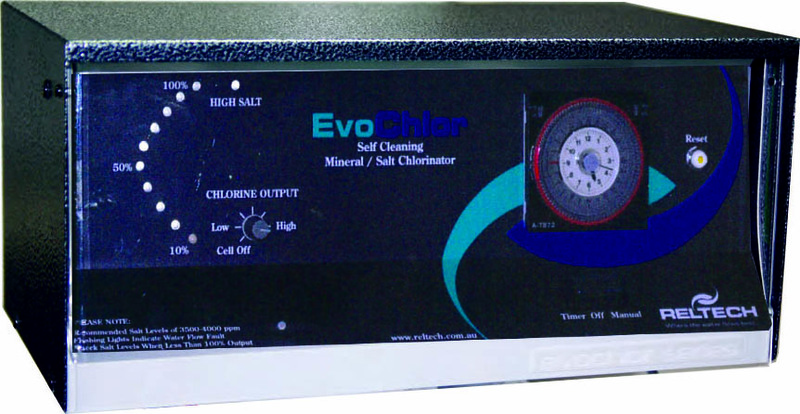 The EvoChlor Self Cleaning Mineral Salt Chlorinator is Australian designed and manufactured, engineered and built for the toughest Australian conditions.. 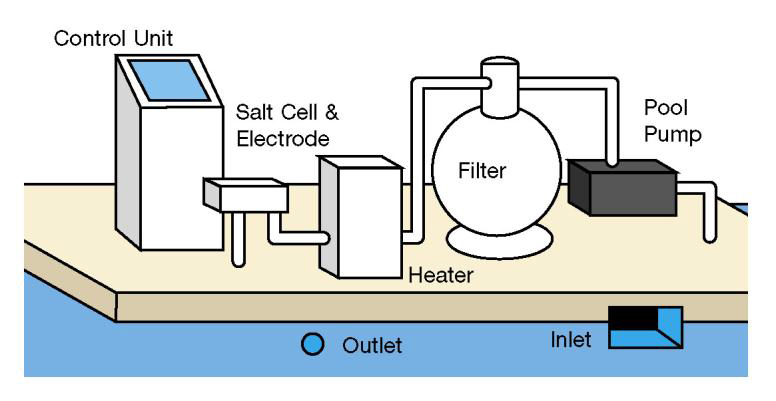 The EvoChlor has a technologically advanced digital micro processing PCB and works with standard salts & Reltech’s “ELEMENT” mineral / magnesium salt. Has a user friendly and easy to set clock. Is energy efficient with low kw consumption, has no internal fuse / external reset button. 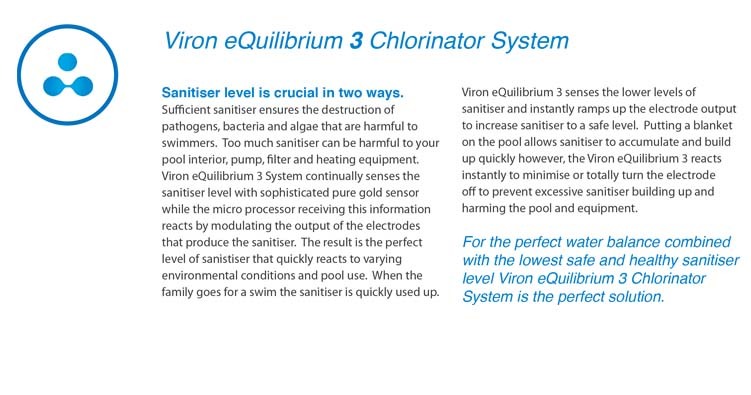 The Viron eQuilibrium Chlorinator provides a range of options to minimise or eliminate the change in water balance. 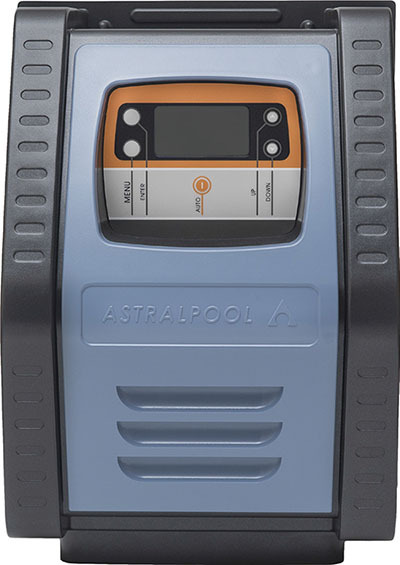 This dramatically reduces manual water testing, maintenance or corrective actions required for your pool water. 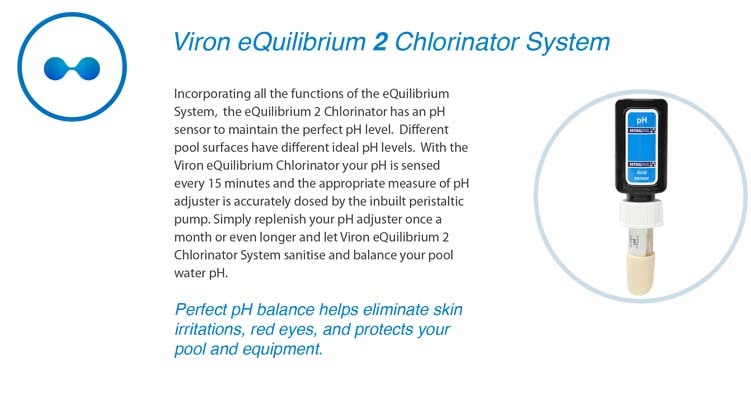 The Viron eQuilibrium Chlorinator can even test, monitor and maintain the perfect level sanitiser and pH balance to keep your pool safe, healthy and looking great. 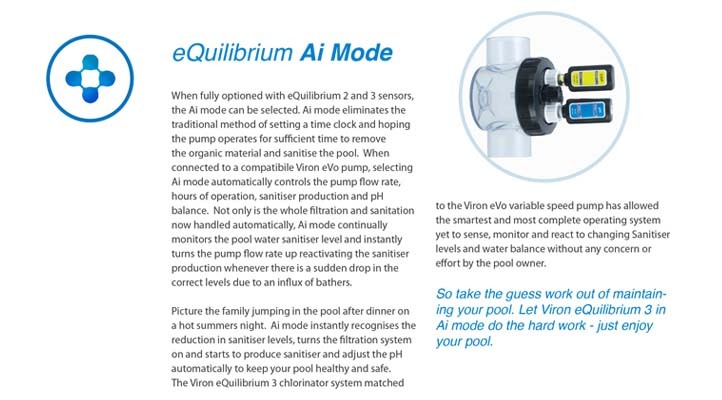 monitors the pool water sanitiser level and instantly turns the pump flow rate up reactivating the sanitiser production whenever there is a sudden drop in the correct levels due to an influx of bathers. 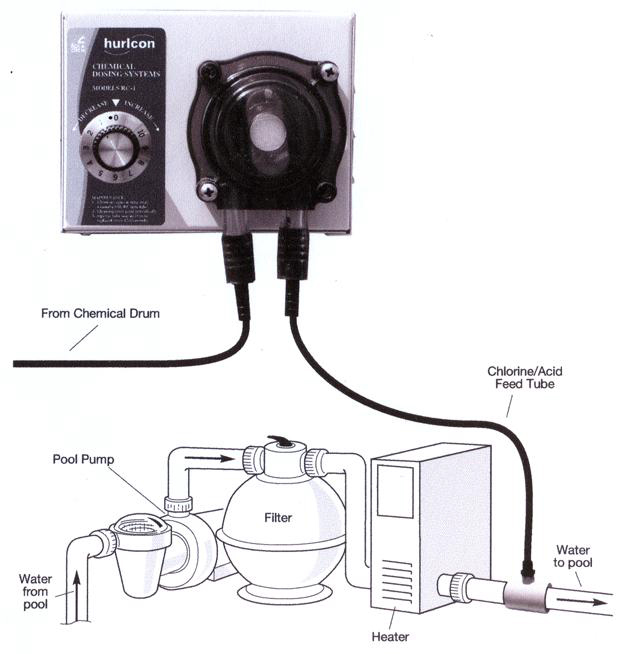 The fully automatic models are designed to accurately dose liquid chlorine and/or acid into the return to pool pipe line, controlled by a ORP probe automatically dosing when required. 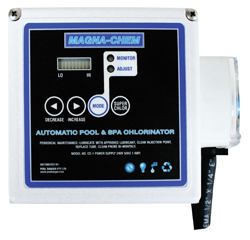 Also available in semi automatic providing an economical and reliable liquid chlorine or acid feeder dposing your pool water at regular intervals. 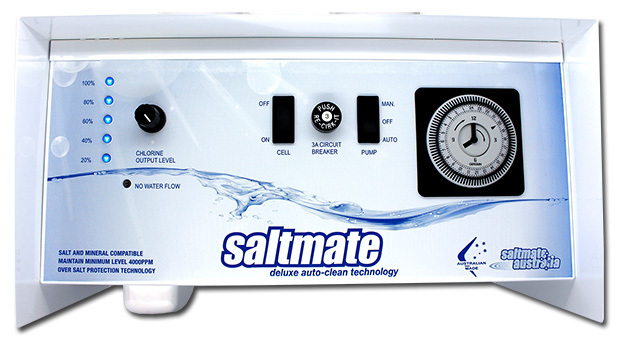 If the prospect of never having to fuss with the hassles of transporting and purchasing chlorine again isn't enough to make you a Saltmate Deluxe Saltwater Chlorinator fan think of this; "just soft, safe, sparkling water for you and your family to enjoy" No more red eyes, no more skin irritation and no time lost due to high chlorine concentrations - just soft, safe, sparkling pool water for you and your family to enjoy. 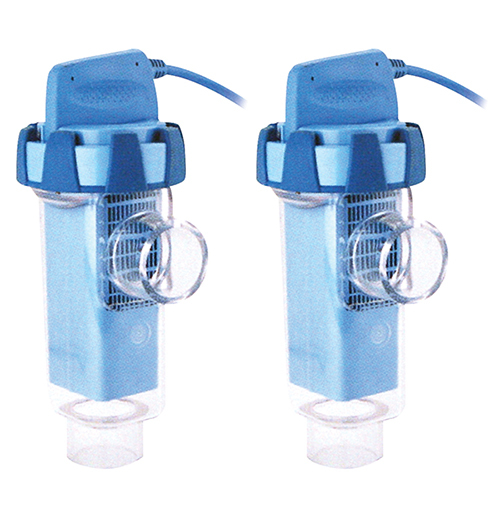 TheDeluxe Saltwater Chlorinator range has been designed and constructed in Australia specifically to be weather protected to an I.P 34 rating with a water resistant robust metal casing to ensure that it will withstand the harsh outdoor climate. 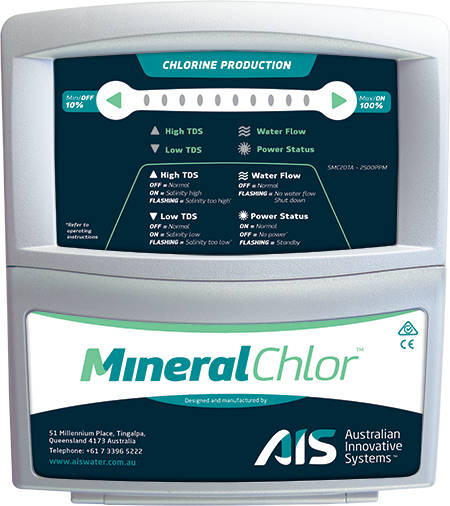 The AIS MineralChlor Advanced Mineral Pool Chlorinator has been specially designed for mineral pools and spas, optimised for magnesium, potassium and/or calcium chloride based applications as well as traditional sodium chloride pools. 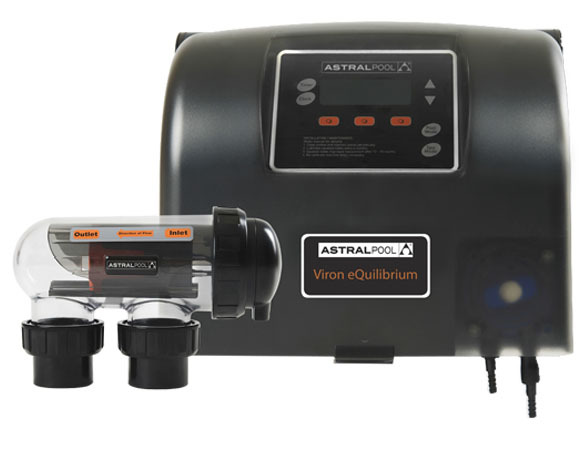 To keep your pool algae and bacteria free doesn’t have to be a daily task. 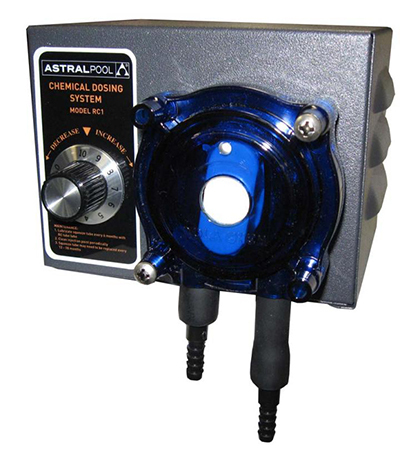 The RC1 chemical dosing systems is a semi automatic sanitiser or acid dosing pump with an adjustable dosing volume. 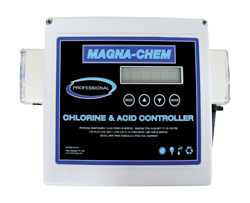 This chemical doser adjusts the daily volume of pH adjuster or sanitiser according to your average requirements. 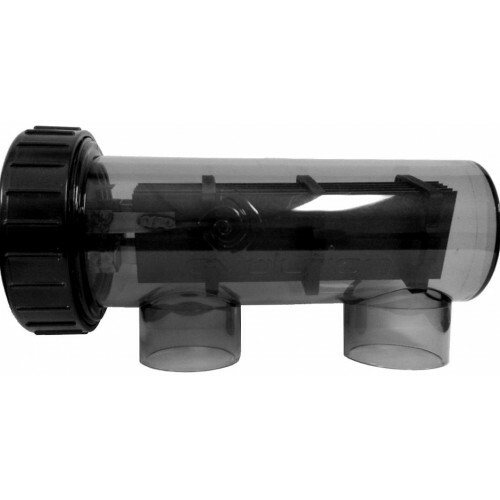 Available in a wide range of sizes for any application.